by one of their great jugglers. juggling precision, he brings us his own 7 ball number. An absurd choreography leaves the crowds ribs aching. Will he achieve the seemingly impossible? Oh yes! But not before the tension is high enough. scarf and one big idiot together? A very funny image, a happy laughing audience, and an extremely pleased kid. and in this case there is, a mystery prize! There’s no reason why this should fail! 4 poles, 1 rope, 3 fire torches, a little help and a lot of belief, that’s all you need. Unfortunately the help seems incompetent, and as for belief, Andy seems to be alone in the opinion that this will work. 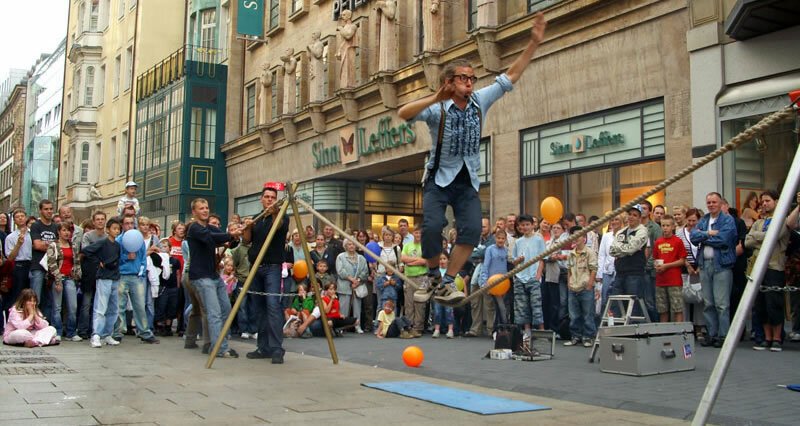 rope and juggles fire at the same time, winning the applause of all present. Imbalance is 45 minutes of side splitting fun!